This quote works, more often than not, just as well for horror movies and their function in our culture. Boogymen and creatures that go bump in the night are all well-known, and horror stories build them up to display both their menace and their ability to be defeated. Mostly. Enter Prince of Darkness, the nihilistic and dread-soaked waking nightmare from John Carpenter. The middle entry in Carpenter’s famous “Apocalypse trilogy,” with The Thing and In the Mouth of Madness acting as bookends. Prince of Darkness tells the audience that yes, monsters exist and per the stories, we all know they can be killed—but what if they couldn’t? Prince of Darkness is shot in a fairly matter-of-fact style, allowing the frame to be filled and emptied as characters, creatures and whatever in the hell is in the cylinder in the basement enter and exit our view. And so, when the creepy happenings begin encroaching on the decrepit church in which something worse than literal Satan is imprisoned, it’s just…there. Which works to the film’s benefit, as we’re put closer to the perspective of the team of specialists summoned by Donald Pleasance’s wizened elder priest to study the cylinder. Carpenter's screenplay (written under the Martin Quartermass pen name) sets up the plot such that we’re introduced simultaneously to the sides of ancient faith and modern reason which come together to, if not stop outright then at least stave off, the world’s impending doom. Victor Wong (Big Trouble in Little China), playing Professor Birack, gathers his grad students of various disciplines and lectures them on how, with all modern technology and thought with humanity’s progress, the strongest theories held about the laws of reality and physics break down beyond a certain point. 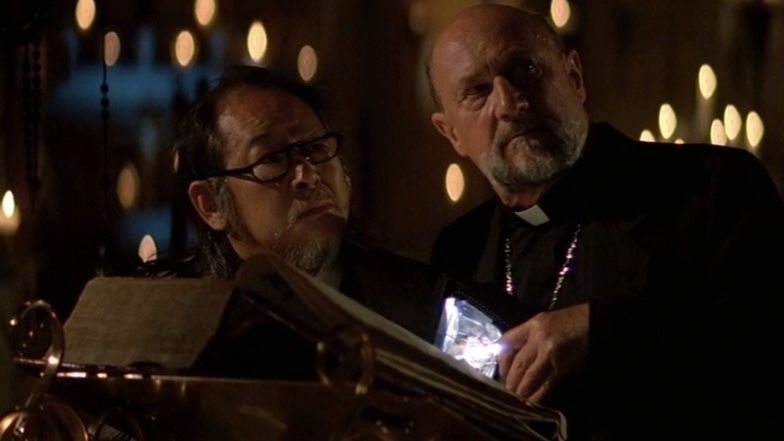 At the same time, Donald Pleasance’s priest pieces together that he is the last of a secret order within the church to guard what can never be allowed freedom. Realizing he’s in over his head by himself, the priest calls to the modern advances in science and asks Professor Birack to approach the problem in a new way. Neither faith nor reason, in their approaches to understanding what they’re up against, is truly prepared to face what will come for them. The dread which Carpenter laces throughout is based on a systematic breakdown of every way which humanity reconciles the world around them with their perceptions. His characters are first presented in circumstances they feel they comprehend. Then the script twists those perceptions and circumstances into something which makes no sense—bringing them, as a group, down to the sub-atomic level Professor Birack mentions in his opening lecture. Water flows up, people squirm as swarms of festering bugs, and dreams are broadcast into the mind like radio plays. To these people of the utmost height of sense and logic, the very world itself ceases to make any sense at all, and the faith that most would turn to in such circumstances goes unrewarded.